Solve Python Exercises using Code editor. Tutorials and Exercises cover Python Basics to Database and Data Analytics. Note: Every week i add New Python Tutorials, Exercises, and Quiz. Subscribe to Get weekly Newsletter. Each Tutorial teaches you something different and contains a specific skill to learn. Quiz and Exercise for each tutorial topic so you can practice and improve your Python skills. Practice Each Tutorial examples and Exercise in Code Editor. Perform all MySQL database operations from Python and develop Python applications with the MySQL database server. Perform all PostgreSQL database operations from Python and develop Python applications with the PostgreSQL database server. Learn how to generate random numbers and data in Python using a random module and other available modules. Learn to seed, sample and shuffle the random data in Python. Secrets module to generate a strong and secure random data and tokens. Learn Python UUID module to generate the universally unique identifiers.generate a version 1, 3, 4, and 5 UUIDs. Learn Python basic concepts in detail with example such as input and output. Free Coding Exercises for Python Developers. 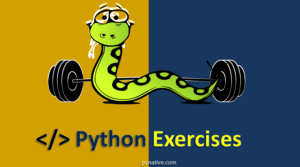 Exercises cover Python Basics to Data analytics and Database. Online Python Code editor to execute Python Code and Practice exercises online. Useful Python Tips and Tricks Every Programmer Should Know. Make your code smaller and efficient. Subscribe today and receive New Python Tutorials, Exercises, Tips, and Tricks straight in your inbox Every WEEK!